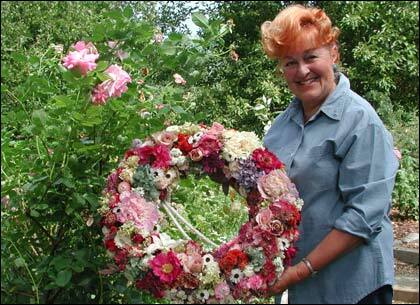 Dried-flower expert Cathy Miller poses with a colorful, durable wreath she created from last year's flowers. Michael Weishan gets a lesson from expert Cathy Miller in how to work with dried flowers and create striking arrangements that will last all year long  and longer. As long as you choose the right ones in their prime, drying flowers is easy to do, and provides the perfect way to enjoy beautiful arrangements throughout the winter months. While a few flowers such as irises, daffodils and tulips, contain too much moisture to be able to dry properly, most flowers happily lend themselves to dry preservation. Most "spiky" flowers, such as salvia and artemisia, can dry adequately hung upside down, with their leaves removed, in the open air. Most rounder, clustered flowers on the other hand are best preserved by treating them for a few days in a drying agent  which is the process we describe below. 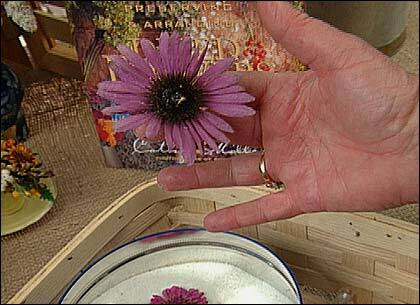 Dried in silica gel for six days, this purple coneflower has retained its vibrant color. Cathy emphasizes that the key to ensuring your dried flowers have gorgeous, lifelike color is to make sure you pick and preserve them when they're just at their peak. 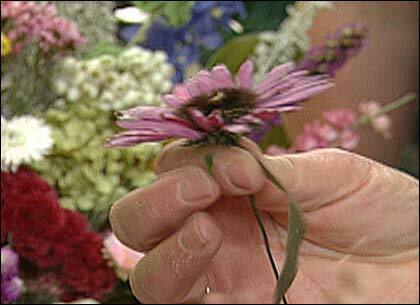 For the flowers you're going to dry in silica, cut them so that you leave a 1-inch stem. Then into a tin that you've filled with a 1- to 2-inch base of silica, place the flowers face-up and well-spaced (about two or three flowers to a tin, depending on its size), then gently cover them over completely with more silica, from the outside edge inward. Replace the tin lid tightly and store it in a dry place. For most varieties six or seven days will be all it takes to have colorful flowers, perfectly preserved. Cathy does caution, though, not to leave flowers in the silica for too much longer than the prescribed week, or else they'll become brittle and begin to turn brown. To create a new stem for a dried flower, use 19-guage wire and dark-green floral tape. The final step is to replace the stem you removed with a new, permanent one. For this Cathy recommends using 19-guage wire, available from any craft shop, and dark-green floral tape. Cut a piece of wire to the desired stem length. Take a few inches of tape and start it around the tip of the length of wire, then place the wire alongside the stem under the head of the flower. Twist and pull the tape to wrap it in a spiral around both the wire and the stem to join the two. Now you're ready to arrange! Below is a list of most of the flower varieties featured on the show in the dried-flower segment with Cathy Miller, together with her recommendations for drying each one. Cathy Miller is author of Harvesting, Preserving and Arranging with Dried Flowers (1997). This segment appears in show #2718.